There has been a lot of growing in the last month. Hand-stitched Dad has been volunteering with me, and it has been lovely to share that with him. He really is a natural with the girls, way more than I was when I started. I may have a keen eye for observing and knowing people, but I need to practice relaxing and being in the moment. This is where hand-stitched dad puts me to shame. I’m learning a lot from him and I wish he would post more often, as he is an inspiration. We regularly chat about adoption. It’s starting to feel more real to both of us, along with the feeling that we really do have a say in all of this! It’s okay to voice what we want, what we hope for… I know it sounds baffling and obvious, but, after years of having our choices and our confidence taken away by infertility, it’s taken a bit of an adjustment. I would say that the biggest achievement in the last month has been my sense of self-acceptance. Self-knowledge is great, but what worth is knowledge if you can’t accept it? I have to battle through a lot of bad experiences to get to a place where I feel genuinely accepted (where I genuinely accept myself). I’m starting to feel that way, and it is really paying off in my social life. I like to think of this as “nesting in my mind” … preparing an emotional home for my future child. It is naturally selfish, as I am the first one to benefit from having emotional well-being. But other people benefit, too. I make no apologies for the time I invest in improving myself. Reading adoption forums makes you feel like social workers will reject you for any sign of weakness. And yet, I can think of nothing worse for traumatised children than a pathologically narcissistic parent! Successful adoptive parents really do have a beautiful balance of humility and courage. The demands are so high. No wonder so many feel so inadequate so frequently. 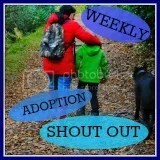 I’ve been a prospective adopter for years now, and I have deep empathy for adoptive parents. I have learned so much about myself from their journeys and struggles. I hope this translates to resilience.